Aja Gample is one of the few active wahine kī hōʻalu, female Hawaiian slack key artists, on the circuit today. She debuts in HPRʻs Atherton Studio on Saturday, January 26, with a program of traditional songs mixed with new stories and mele. Reservations may be made online or by calling the station (955-8821) during regular business hours. Tickets are $25 general, $20 for HPR members, and $15 for students with ID; online service fees apply. The Atherton Studio is located at Hawaiʻi Public Radio, 738 Kāheka Street. Doors open at 7:00 p.m.; music begins at 7:30 p.m.
Gample is a two-time 2017 Nā Hōkū Hanohano Award finalist and 2018 Preliminary Grammy Nominee for her debut album Huaʻi. Veteran Hawaiʻi radio personality Harry B. Soria Jr. called her, "the new face of Hawaiian music and of Hawaiian Slack Key Guitar." 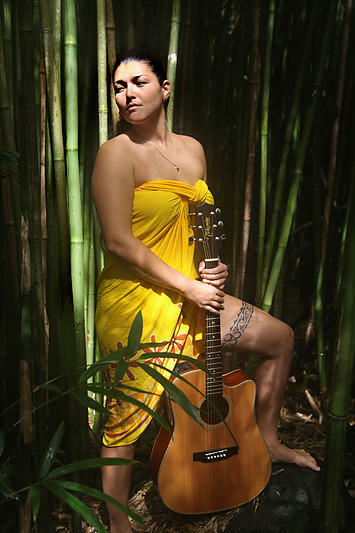 Oʻahu born and raised guitarist/singer/songwriter Aja Gample learned the old style of slack key from her grandfather and implements those foundations into her own style of contemporary Hawaiian music. Inspired by all genres of music and the beauty of growing up here in the islands, Gample uses her music as a platform to continue to tell the stories of her time and perpetuate the Hawaiian language.